I have many articles on this website about the best things to do in Guadeloupe, yet I’ve never compiled them into an overview. After updating all of the separate articles, I figure it’s time, so here it is: a Guadeloupe guide. Note: at the bottom of this list you can find a map with all the sights marked on it. 5 And, of course, beaches! Guadeloupe lies in the Caribbean, closer to Venezuela than to Florida. It’s about halfway between Montserrat and St. John’s to the north and Dominica to the south. Part of France’s historical colonial empire, it is still part of France as a départment d’Outre-Mer. The main islands of Guadeloupe resemble a butterfly in shape. The southwestern wing, called Basse-Terre, is dominated by La Soufrière volcano and the jungle that covers it. 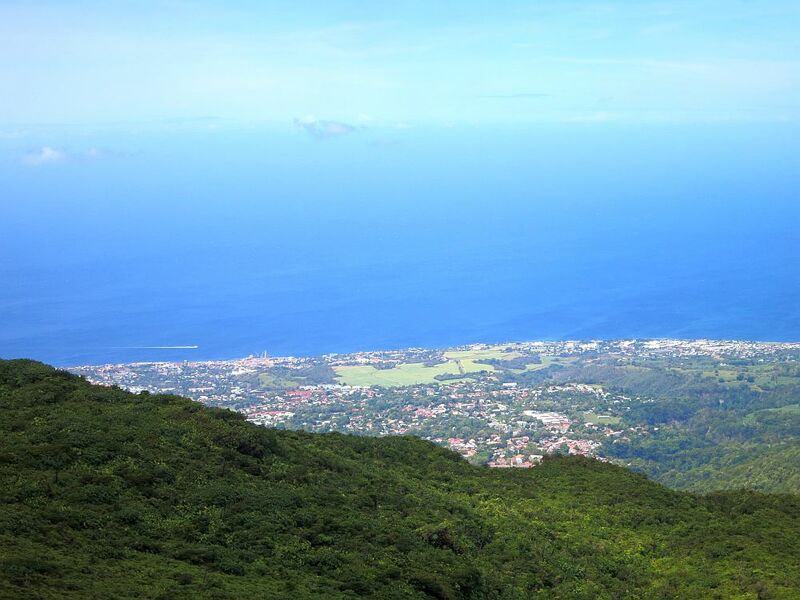 The volcano and that jungle are protected as the Parc Nationale de la Guadeloupe. The towns and villages skirt the edges of the volcano and are mostly right on the sea. The northeastern wing, called Grande-Terre, is only separated from Basse-Terre by a narrow channel. It’s mostly flat, and much of it is used for agriculture: sugar cane – an export crop used for sugar or rum production – and bananas, as well as a variety of fruits and vegetables for local use. The largest city on Guadeloupe, Pointe-à-Pitre, is near where the two wings of the island meet. You’re likely to arrive on the island either through the airport just north of Pointe-à-Pitre or the ferry port in Pointe-à-Pitre. 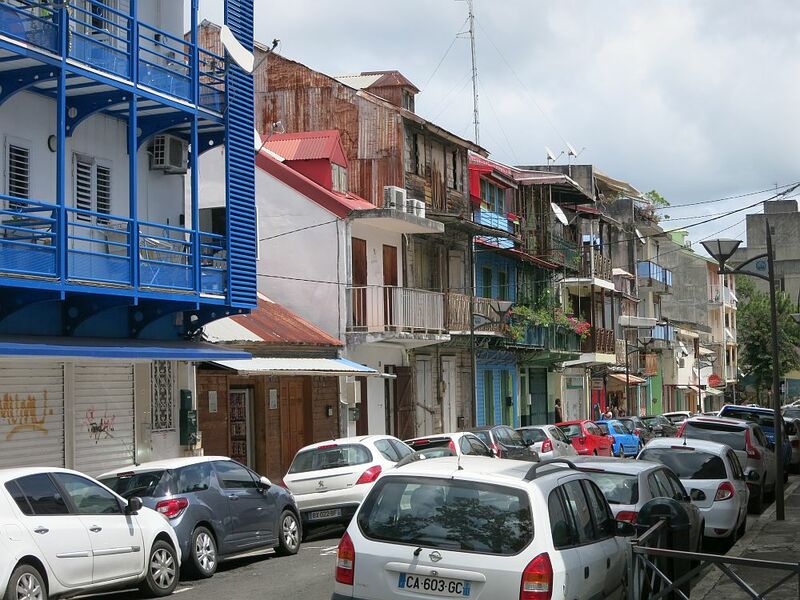 Guadeloupe also includes several much smaller islands: I didn’t go to any of these islands, but I’ve included some of their highlights in this list too. 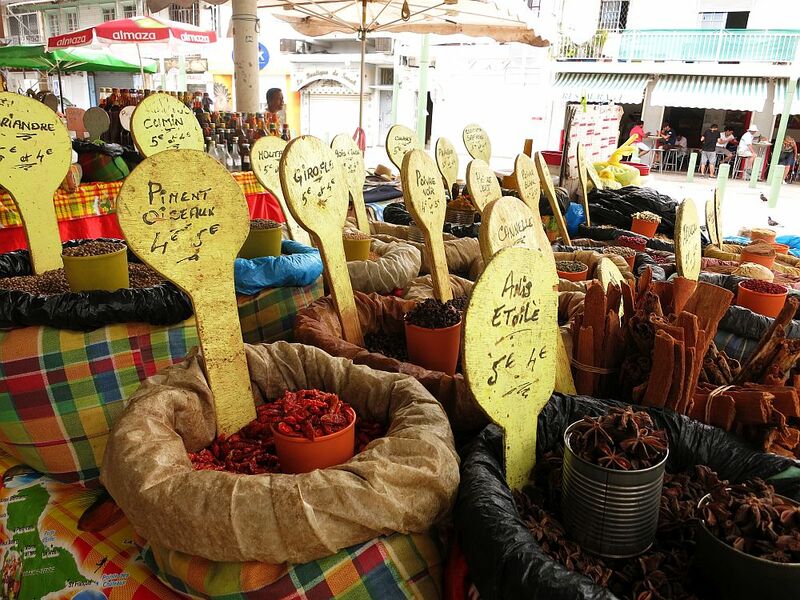 Pointe-à-Pitre has a number of markets, but this pleasant roofed market is squarely aimed at tourism, selling spices and local food products. It’s fun to discover what’s on offer and perhaps buy a gift or two to take home. The Spice Market, also called Marché St. Antoine: Rue Frébault, Pointe-à-Pitre. Monday-Saturday, 6-14:00. This general market includes fruit and vegetables, spices, rum and fish you can buy directly from the fishermen. Le Marché de la Darse: Place de la Victoire in Pointe-à-Pitre. Open Monday-Saturday 6-14:00. Closed on Sundays. The Marché aux fleurs is just what it says: a flower market. The Marché aux fleurs: in front of the Cathedral of St. Pierre and St. Paul. Daily 6-14:00. This is the biggest market in town, mostly selling fruit and vegetables. Marché Bergevin: Corner of Boulevard de l’Amitié des Peuples de la Caraïbes and Lefèvre quay. Open Mondays, Wednesdays and Saturdays from 3-13:00. I would have loved to see this new museum, but it hadn’t opened yet when I visited. Housed in a modern building on the site of a former sugar factory, Memorial ACTe explains the history of slavery in the Caribbean and around the world. It’s a small part of a global UNESCO project about slavery. Memorial ACTe: Rue Raspail in Pointe-à-Pitre. Open Tuesday-Saturday 9-19:00 and Sunday 10-18:00. Closed on Mondays. €15. Memorial ACTe’s website (in French). 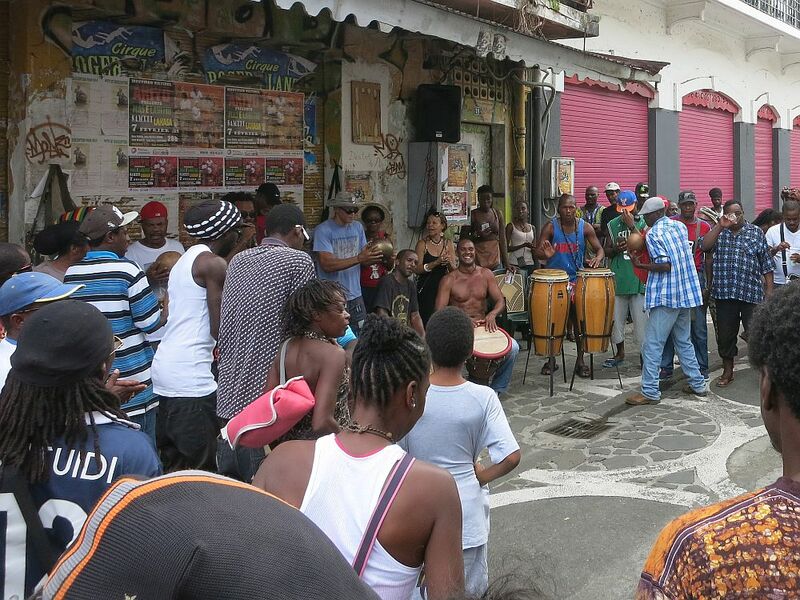 If you’re in Pointe-à-Pitre on a Saturday, make sure to check out the drum performance in the morning. It’s on the pedestrian street called Rue Piétonne St-John Perse. Any local will be able to tell you where to find it. I wrote about it in this article about my Airbnb host. It was closed when I visited, but the Saint-John Perse Museum dates to the 19th century. It’s a lovely New Orleans-style house with ornate balconies, and the ground floor inside is meant to illustrate a typical creole home. It belonged to Alexis Léger, who earned a Nobel Prize for literature back in 1960, and the upstairs is a museum about him. Saint-John Perse Museum: 9 rue de Nozières, Pointe-à-Pitre. Open Monday-Friday 8:30-17:00. Closed Saturday and Sunday. €10. 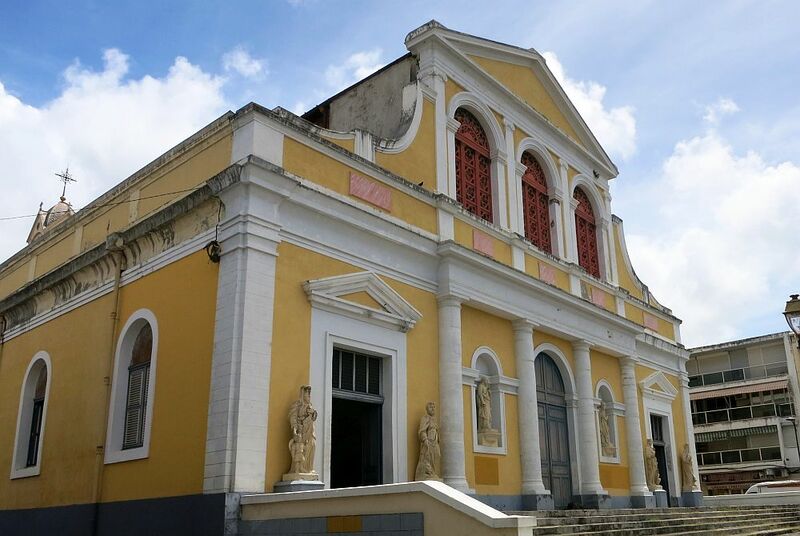 Take a look at this lovely colonial-era church (I’m not sure that the colonial era is actually over in Guadeloupe, given that it’s still ruled from France). In any case, the beauty of the cathedral belies the cruelty that was part and parcel of colonialism. Oddly, the arches, visible inside, are made from riveted iron beams. The Cathédrale de St. Pierre et St. Paul: rue du Général Ruillier, Pointe-à-Pitre. Website (in French). Another option would be to take this electric tuk-tuk tour to all the main sights in Pointe-à-Pitre. While I did not get to this small museum in Le Gosier, it sounds worth visiting. Displays cover historical clothing, but also extend to the history of the island and Creole culture as illustrated by the clothing. Musée costumes et traditions: 1 Périnette in Le Gosier. Open Tuesday-Sunday 9-13:00 and 15-17:00. €9. Facebook site (in French). I visited two coffee plantations that offer tours, Vanibel and La Grivelière. Both are in the southwest corner of Basse-Terre. Both were interesting, though I learned more about the history of coffee farming on Guadeloupe at La Grivelière. For more about these plantations, read my article about both here. This French colonial fort (which I didn’t see, though I don’t know why not!) is well-maintained and offers great views. Since signposting is all in French, it might be worth taking a tour to hear the history of the rebels who resisted Napoleon’s effort to reintroduce slavery. Apparently there’s also an interesting exhibit about the 1976 eruption of La Soufrière volcano. Fort Delgrès: Le Carmel, Basse-Terre. Open Tuesday-Friday 9-16:30 and Saturday and Sunday 9:30-16:30. Free. While little is known about the original inhabitants of Guadeloupe, the Arawak, The Parc Archéologique des Roches Gravées is the place to learn a bit about them. 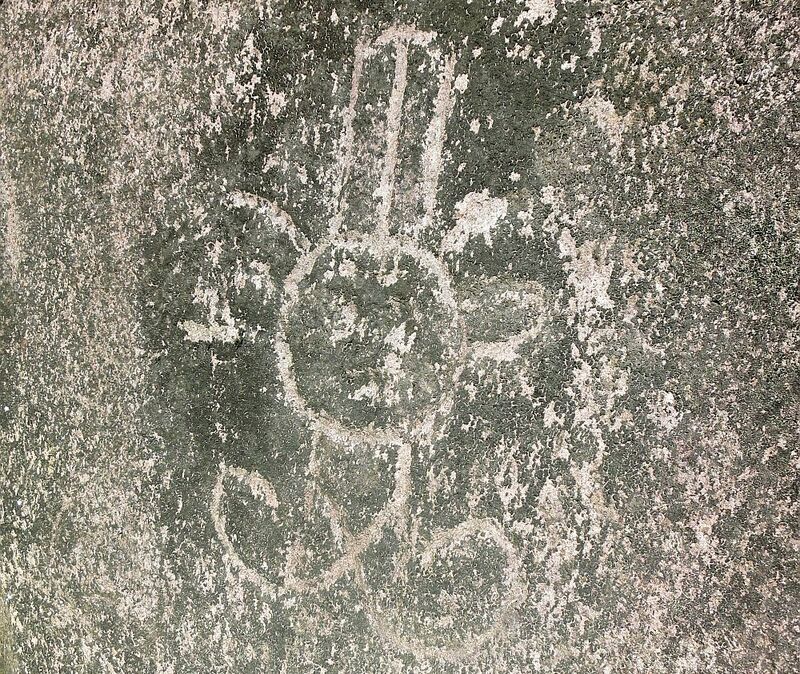 It contains a series of simple rock carvings made by the Arawak. Nearby is a lovely trail to walk along the coast. I reviewed this little park in this article and you can find visitor information there as well. This is another one I didn’t get to, but it addresses the history of the indigenous people, with attention to archeology as well. The garden in which it is set is said to be lovely. Musée de la prehistoire amerindienne Edgar-Clerc: Parc de la Rosette in Le Moule. (Directions from their website: Leaving Le Moule in the direction of Pointe-a-Pitre, after the bridge, take the secondary road that goes straight ahead toward Ste. Margueritte, Gros Cap and Pointe de la Vigie. The museum is 300 meters up the road on the right.) Open September-June Monday, Tuesday and Thursday 9-17:00, Wednesday and Friday 9-13:00. In July and August, open Monday-Friday 8-14:00. Admission is free. Website (in French). 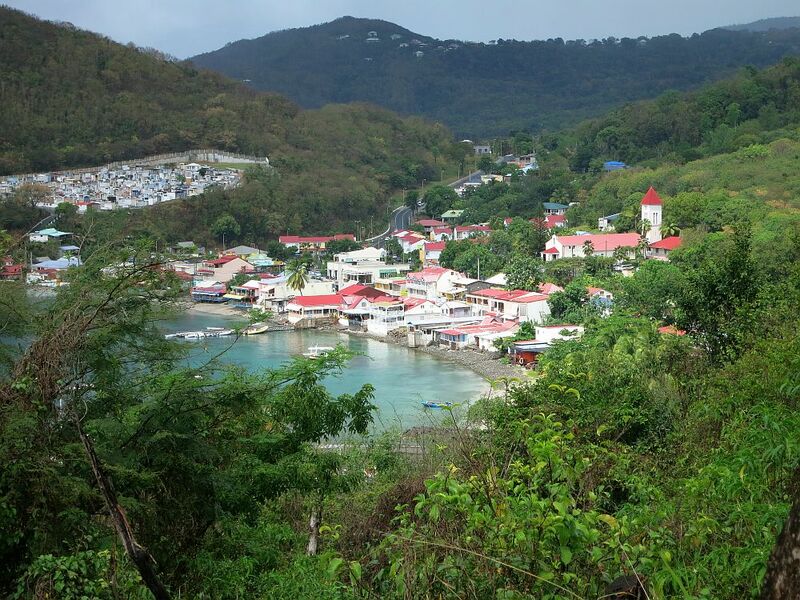 If you watch “Death in Paradise,” you’ll recognize this view of Deshaies. This tour will take you to various film locations for “Death in Paradise,” as well as to the Deshaies Botanical Garden. The Aquarium de la Guadeloupe is in Gosier, not far from Pointe-à-Pitre, and is purported to be excellent. If you’re not going to go diving or snorkeling, at least go there. Aquarium de la Guadeloupe: Place Creole – Marina – Le Gosier. Open Monday-Sunday 9-18:30 and, during school vacations, 9-19:00. €14. Website (in French). I wrote about the chocolate museum in a separate article. 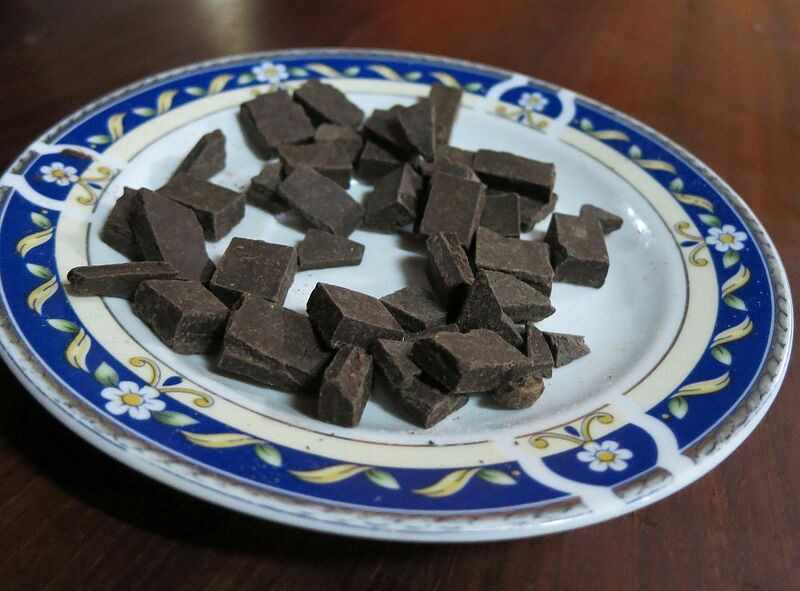 It’s small but informative, offering step-by-step demonstrations of the chocolate-making process, as well as a small plantation so you can see how cacao grows. Chocolate is not a major cash crop here anymore, but the museum makes for an interesting short visit. The Chocolate Museum’s demonstrations include tastings. In my article about the Rum Museum, I commented on the odd range of things on display. You can learn all about the history of rum, but also see an extensive insect collection, model boat collection, and lots more. It’s quirky and fun, and ends with rum tasting! This art gallery manages to combine both excellent-quality modern art by Caribbean artists with exhibits about Guadeloupe’s history from the Arawaks who lived here before western colonization through the colonial period. It’s an unusual combination that somehow works. See my article about it here. Another small gallery, called the Musee des Beaux Arts, is nearby in Saint Francois. The brightly-painted home of Kreol West Indies. 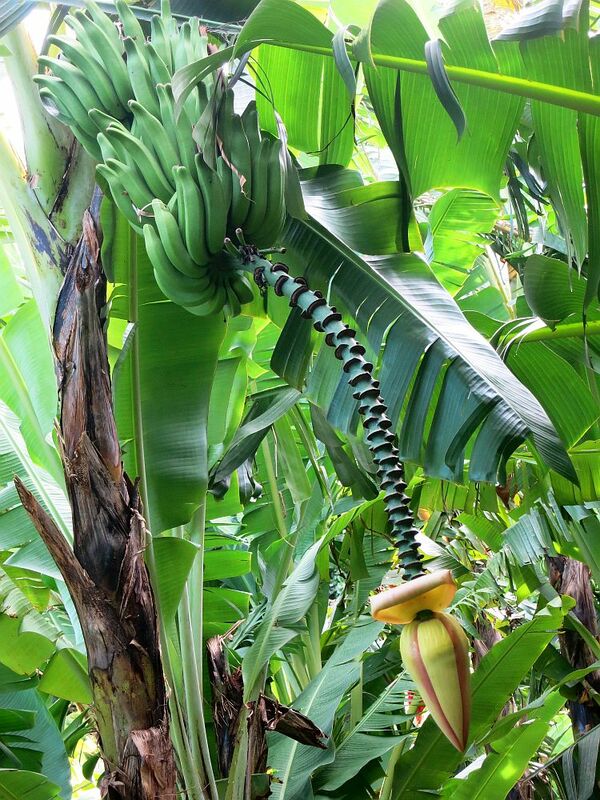 Housed in a former plantation, you’ll learn all about banana cultivation here, including a tasting of different varieties of bananas. You can stroll the tropical grounds and tour the plantation houses, which have another odd collection of artifacts similar to the Rum Museum’s. Read all about it here. This park includes a range of activities. An interactive exhibit on pirates is sure to please the kids. There’s also a playground including a treehouse and an arboretum of rare species. A plantation house gives an idea of life in colonial times. Habitation Cote Sous-le-Vent: Pointe Noire, Basse-Terre. Open daily all year 10-17:00 (last admission 16:00). €14.50. Website (in French). As I mentioned before, the Parc Nationale de la Guadeloupe, or National Park of Guadeloupe, covers a large portion of Basse-Terre. Within the park boundaries there are a number of things to see. It might be a while before you get to see the top of the volcano, since its top extends into the clouds. If you feel up to it, though, hike up to the top for a look into the Porte de l’enfer (the gate to hell) and watch (and smell) the steam escape. 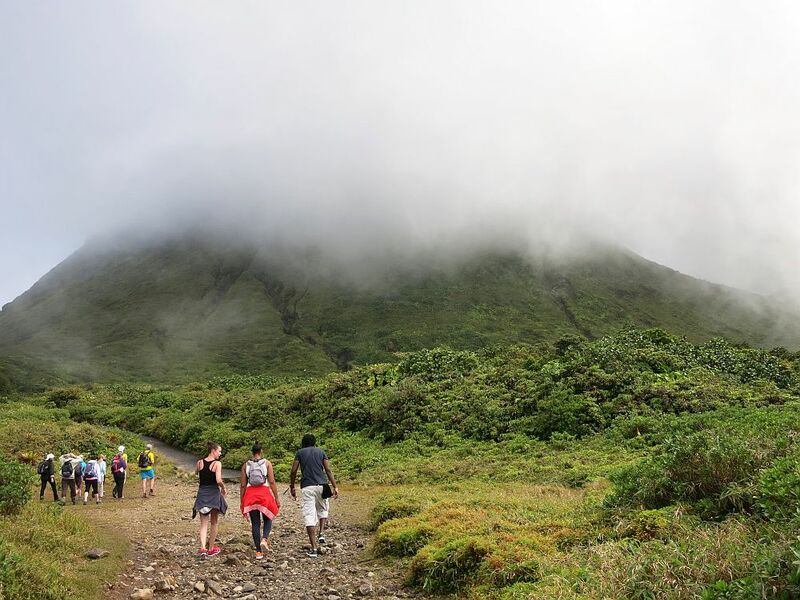 If you’re not particularly fit or unused to hiking, like me, you would do well to read my tips for climbing La Soufrière before you go. If you feel more comfortable with a guide, you can arrange it through this link. The second part of the trail up the volcano, taken while the summit was hidden in the clouds. These waterfalls within the national park are all reachable as day hikes (See my post about #2 here.). It’s not really about the waterfalls, though. It’s about enjoying a walk through a rainforest. I wrote about this waterfall in my article about Airbnb and the special experiences an Airbnb stay can lead to. Bras du Fort flows into a still green pool, edged by rainforest. It’s absolutely magical. The problem is that I can’t explain where it is. I was led there by a local, so you’ll need to just ask until you can find someone to take you. Another walk that is reputed to be fairly easy is to the waterfall called Saut des Trois Cornes, near Sainte Rose. Bring a bathing suit and swim in the pool under the falls. This botanical garden in Deshaies gets great reviews, which, besides praising the beautiful landscapes, including orchids and other tropical vegetation, mention feeding fish and parrots as highlights of a visit. Deshaies Botanical Garden: just south of the village of Deshaies. Open daily 9-17:30 (Last admission at 16:30). €15.90 Website. Les Jardins de Valombreuse Parc Floral et de loisirs is a large botanical garden that is very popular. It’s apparently especially good if you’re traveling with children because if its play areas. Valombreuse Gardens: Chemin Valombreuse, west (inland) of the village of Petit Bourg on Basse-Terre. Garden open daily 8-18:00. Children’s activities are open daily 9:30-17:30 during school vacations. Otherwise open Wednesdays, Saturdays and Sundays 9:30-17:30. €13. Website. This is the very easternmost tip of the east wing of the island. It’s rocky, with waves pounding dramatically over the rocks: a great place for a contemplative walk. When I was there, I had it to myself as well, so I spent some time sitting, watching the frigatebirds swoop and dive above the brilliant blue waves. The road to Pointe des Chateaux passes some lovely white-sand beaches. This is the view back along the peninsula from Pointe des Chateaux. Notice all of the empty white-sand beaches. I’m not sure if this counts as natural, but this zoo in Bouillante gets good reviews, especially if you have small children. Canopy bridges (minimum 8 years old) allow visitors to view animals and rainforest from above. Guadeloupe Zoo: Route de la Traversee, north of Bouillante and inland from Malendure Beach. Open daily 9-18:00 all year (last admission 16:30). €15.50. Website. I didn’t go to many beaches, and there are beaches everywhere, so I can’t give much guidance in this category. If you stay at a hotel, it’ll likely have its own beach, but don’t limit yourself to just that one. I’m listing just a few here fairly randomly. This beach is right in Le Gosier. It’s a white-sand beach with kayak rentals and showers. Food is available along the beach. Another beach with full facilities is Anse du Souffleur. If you drive or walk long enough, you can find small isolated bits of beach that you can have to yourself. On one side the waves can be rough, while on the other the water is generally calm. Leroux Beach is said to have good snorkeling. No facilities. I know that Malendure Beach, on the western side of Basse-Terre, is popular and has all of the facilities you might be looking for. Malendure Beach is also a great spot to watch the sunset. As I mentioned above, on the way to Pointe des Chateaux, both sides of the road are beaches, separated from the road by low, scrubby vegetation. While there are no facilities until the very tip of the island, you can pull off the road anywhere here and settle down to relax on the beach. You’ll have to bring all your own food, water, towels, etc. Guadeloupe is home to an underwater reserve named after Jacques Cousteau. There are plenty of companies that can help you enjoy the reserve. Snorkeling: I went on a snorkeling tour with La Rand’eau, leaving from L’Anse Duché. You can read about that rather surprising experience here. Other companies offer diving, snorkeling, glass-bottom boat tours, and kayaking. I’m not sure how great any of this would be now, after several hurricanes have damaged beaches and coral reefs. You could also go sailing or fishing from various points around the island. Or try canyoning along a river in Basse-Terre. Or it might be fun to rent a seabob. While Guadeloupe is quite a small territory, it includes some even smaller islands, both inhabited and uninhabited. I only explored the two main islands, but here is an overview of the others. Îles de La Petite Terre is made up of two uninhabited islands: Terre-de-Bas and the smaller Terre-de-Haut. Both are protected as a marine and land reserve but are popular places for day trips. Take a boat trip – I suggest sailing rather than going by motorboat – to Petite-Terre to spend a day snorkeling and/or diving and beaching. This place has mixed reviews in terms of the condition of the coral reef. You can take a hike on the island as well, to spot the protected iguanas. Îles des Saintes is a group of islands south of Basse-Terre. The main islands in the group are Terre-de-Bas and Terre-de-Haut, each with a very small population of a few thousand. The main businesses are fishing and tourism. The other seven small islets are uninhabited. Terre-de-Haut is only five square kilometers in size, but the village there, Bourg des Saintes, is picturesque and the Catholic Church in the village is worth a visit. Fort Napoleon, the colonial fort on a hill above the village is in good condition and includes a museum of the fort’s history. It sounds like it’s worth the admission price just for the views. Apparently it also includes a conservatory of cactuses from around the world. You can rent a scooter or golf cart to get around. Fort Napoleon: Terre-de-Haut island. Open Tuesday-Sunday in April-October 10-16:00 and Wednesday-Sunday in November-March 13-17:00. €5. 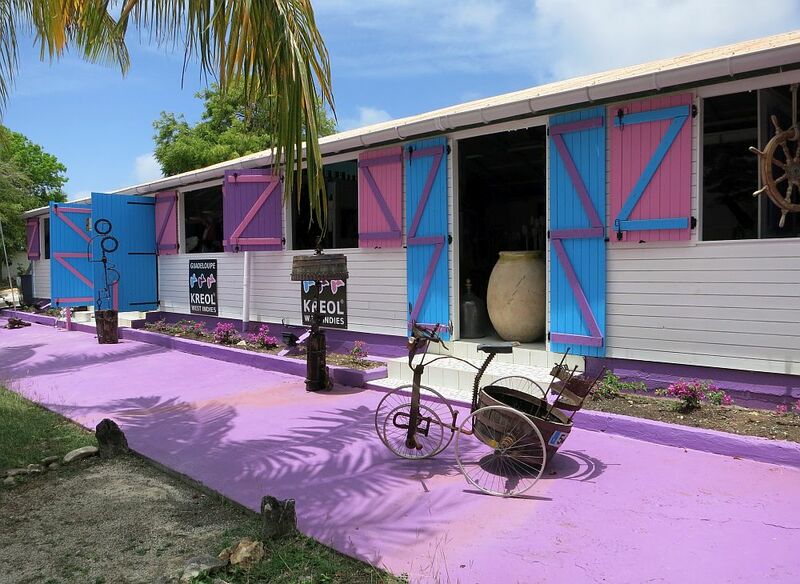 Besides beaches, which are said to be fabulous, Marie-Galante has three rum distilleries, all of which you can visit and all of which offer tasting. Since the island used to be devoted to sugar production, you’ll spot ruins of windmills here and there. This old sugar refinery/plantation shows a bit of the history of slavery in this region. 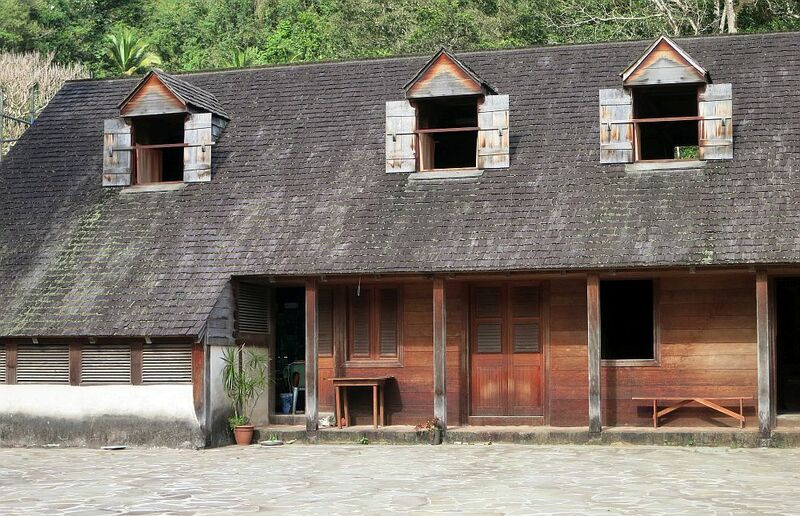 is another former sugar cane plantation, now a museum illustrating the sugar cane industry. Part of La Désirade is a geological reserve as well as a marine reserve. 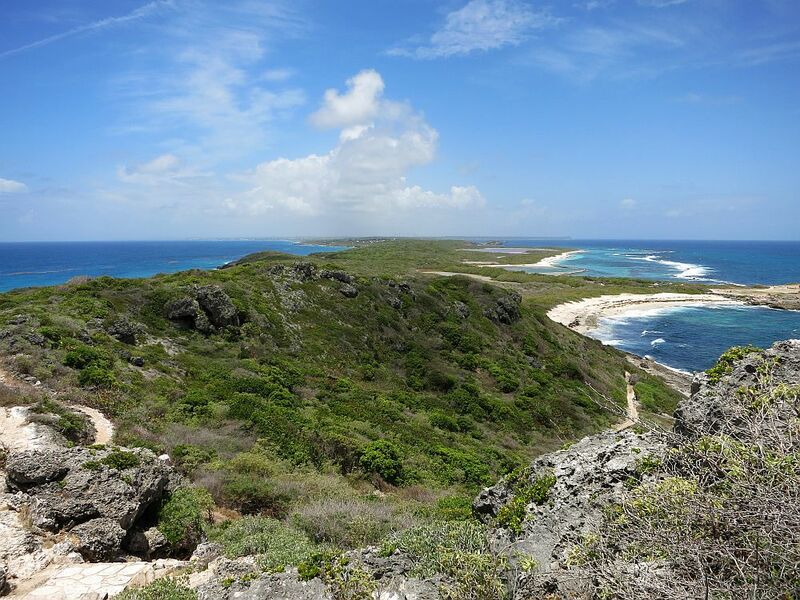 It is a geological reserve because it is the oldest island in the Caribbean, with rocks that are of particular interest to geologists. Many of its species of flora and fauna are endemic to the island, including an unusual cactus called tête a l’Anglais. Iguanas are also protected here. The marine reserve (AGOA Marine Mammals Sanctuary) is specifically focused on certain species of whales and dolphins. 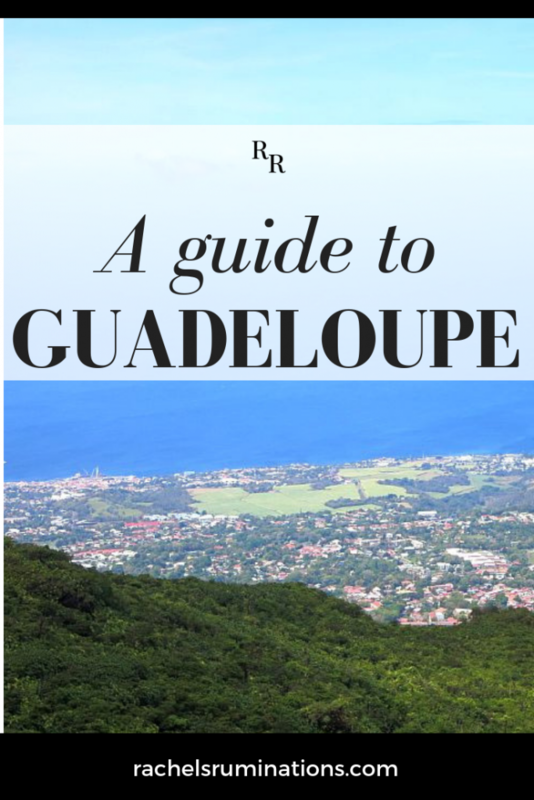 Believe it or not, this Guadeloupe guide is not exhaustive. 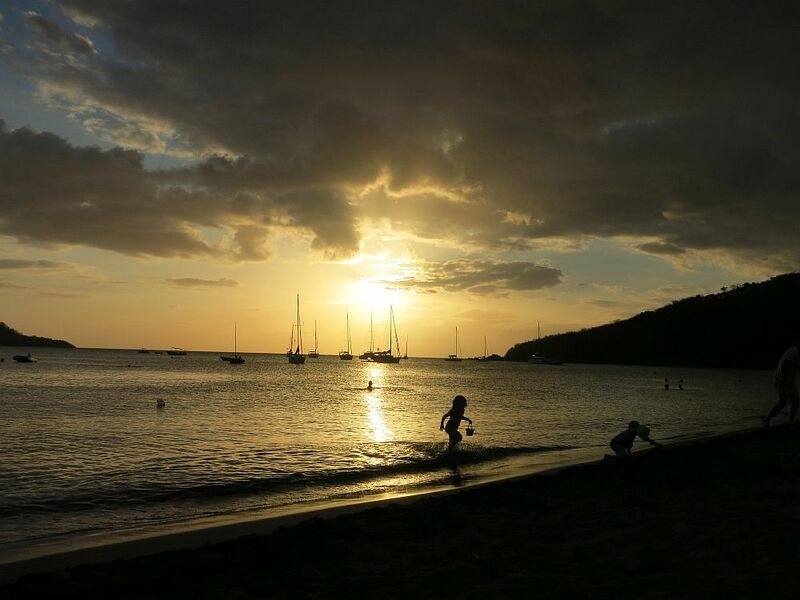 Guadeloupe has more sights to see and dozens more beaches and activities. I think I can safely say, though, that these are the most visited and most enjoyable ones to see. I’ve marked all of the places listed in this article on the map below, so you can plan what you want to do in what order. Have fun! Since the list doesn’t cover everything, I have a request: if you decide to go to Guadeloupe, I’d love to hear what you thought and what you did. Is there something you’d add to this list? Or something you would remove? Let me know in a comment below! 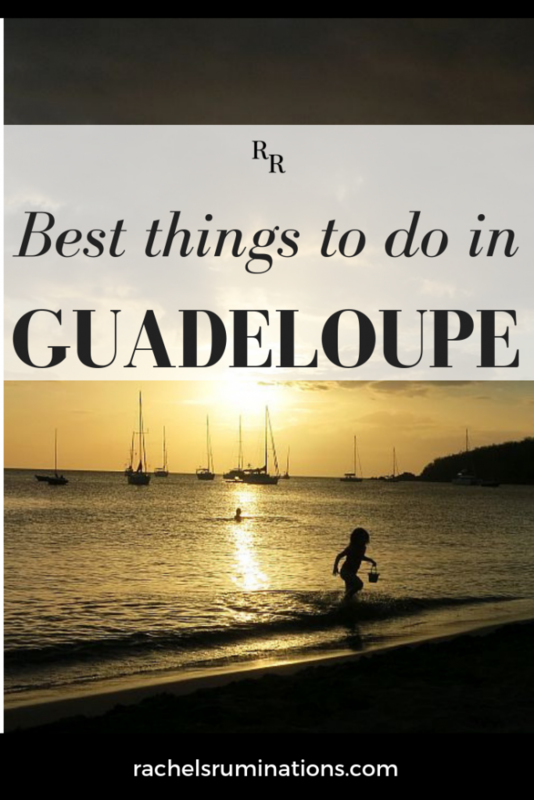 Gosh what some amazing things to do in Guadeloupe. I’d love to visit. 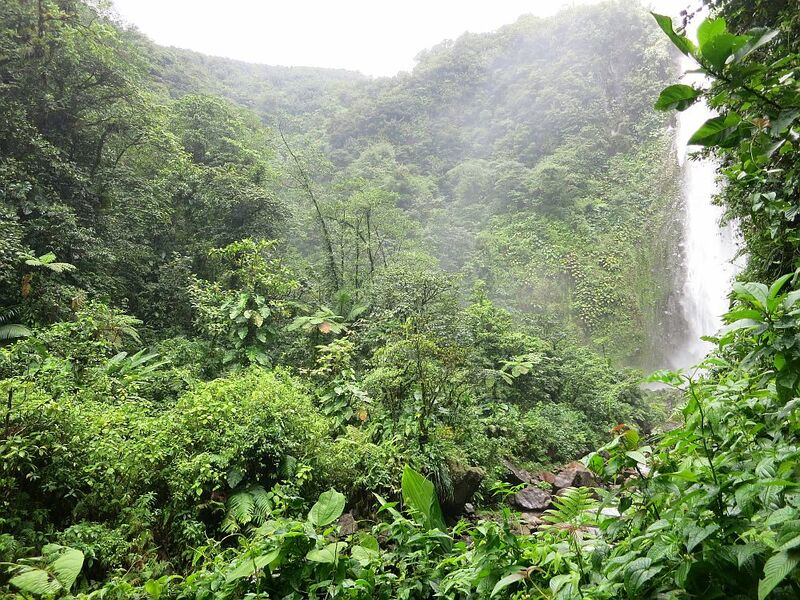 Your lead image taken of the side of La Soufrière volcano in Guadeloupe is stunning. Wow! 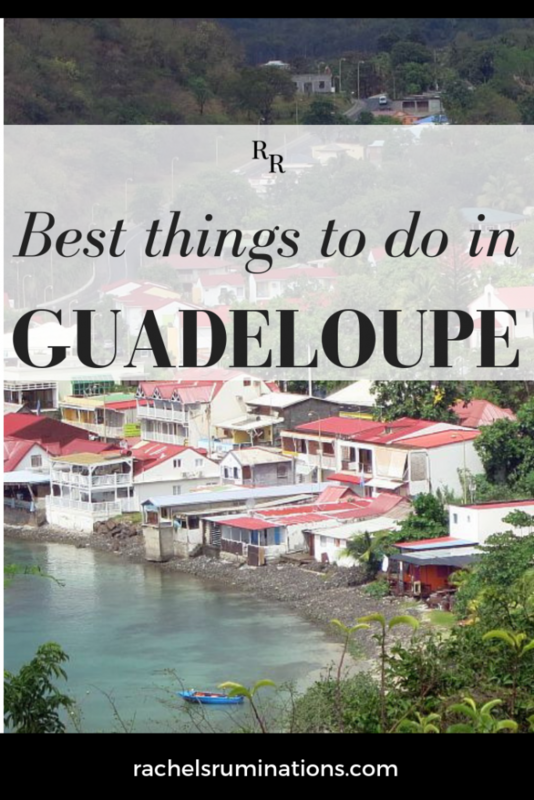 This pretty much covers everything you might want to do on Guadeloupe! I would definitely want to see the markets–especially the spice market–and that banana museum sounds intriguing. Hope I get there some day. I never would have guessed that there was so much to do and see on Guadeloupe. Chocolate, rum, and banana museums!! And I agree with one of the other comments, going t e local markets is always a must-do for us with Marche Bergevin first on the list here. When next we decide to visit the Caribbean, we’ll surely have to consider here. I’ve visited a majority of the islands in the Caribbean but, with the exception of Iles des Saintes, which I visited from a Star Clippers cruise, I have yet to make it to Guadeloupe! I hope to someday and appreciated your overview of all there is to see and do. OK, Guadeloupe is officially on my bucket list. Pinned. It stays on mine. I so want to go back!